Thursday, 8/9/12 - Animal Week at Little Gym! This day we had Z's class, then Baby E's class, then camp for Z, so she needed a lunch to eat while Baby and I were in class. Cool Treats: Mostly to go with the theme, I added in a few dye-free Trader Joe's liquid-filled gummy penguins in a mini muffin cup. They're her favorites, since she's a fan of chewy (just like her Mama!) with a burst of juice inside just for fun. Picking Berries: I got some zoo animal cupcake picks and chose two that weren't represented elsewhere in the lunch to go with her raspberries in an attempt to keep her fingers clean. Fat chance! FroYo Hippos (and Lions): Since I actually planned this one ahead (*gasp! *) I was able to scoop some Chobani Champions Verry Berry yogurt into a zoo animal ice cubes mold and freeze overnight to include in her lunch. I packed a spoon (and straw - she loves "drinking" her yogurt) in case they thawed by lunch, but kept the lunches in my EasyLunchboxes insulated cooler bag with an ice pack in an attempt to keep them frozen for her. I got the idea to make these from The Keeley McGuire Blog. Saw some other fun uses for my silicone molds from a guest post by Veggie-Bento, so I might be trying hummus next! Bear With Me: For the sandwich, I used a circle cutter for the head. I used a smaller one for the ears and snoot, and used the head cutter to cut curves into the ears to make them fit better. Since one of the sandwich slices was a heel turned fluffy-side-out, I made sure to cut the snoot out of the scraps for that and flipped it to make a contrasting circle. Raisin eyes and nose, and everything secured with uncooked spaghetti noodle bits. Please note that EasyLunchboxes are temporarily SOLD OUT! Don't go all Apocalyptic and start rioting or anything though. They're due back late September! You can click my link and add them to your wishlist! *Update - Back in stock! LOVE IT! 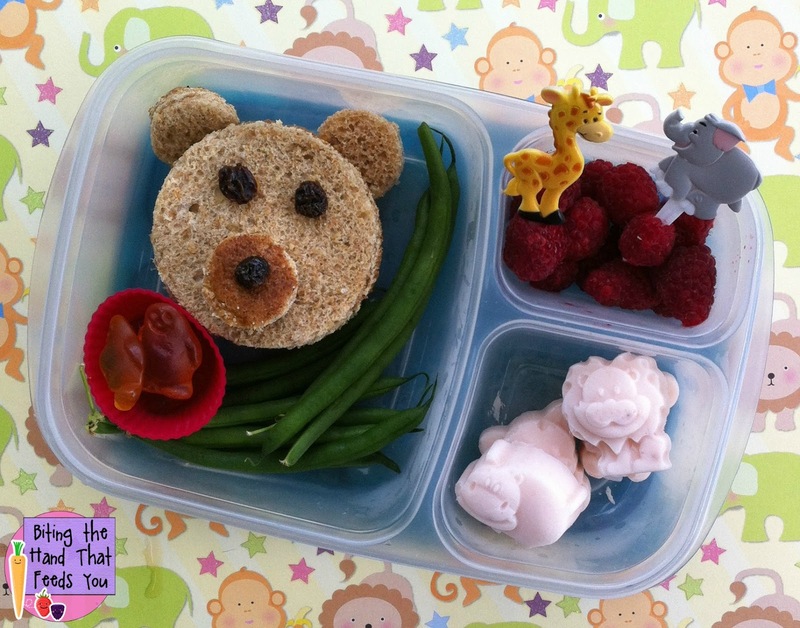 I made a zoo themed lunch and it was no where near as cute. Love the animal silicone tray!